WHITE LINEN CUFFED BOTTOM TROUSERS M&S NEW!! WHITE LINEN TROUSERS M&S NEW!!. SLIGHTLY DIRTY ON THE CUFF AT THE BOTTOM,BUT WILL WASH OFF. M&S linen blend trousers - size 12 short. Ladies M&S Short Wide Leg Linen Trousers. Material : 100% Linen. Waist 32" 82 cm Inside Leg 25.5" 65cm Bottom of Leg Width 14" 35.5cm. M&S Peruna White Linen Crop Pants 12. Condition is Used. Dark grey trousers. M&S Indigo. 100% Linen. Waist 32” Rise 10” Inside Leg 29” Size 10. 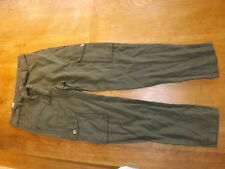 Ladies M&S Khaki Linen Trousers Size 18. Condition is Used. Dispatched with Royal Mail 2nd Class. These are lovely linen trousers. Please see picture of slight dis colouration at the waist where the draw strings are. These cannot be seen when wearing top. 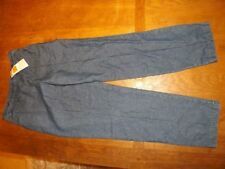 WOMENS PER UNA M&S LINEN NAVY TROUSERS 8S..
WOMENS PER UNA M&S LINEN NAVY TROUSERS 8S... Condition is new without tags. Dispatched with Royal Mail 2nd Class. Smoke free home. Please take a look at my other items. Condition is Used. 55% flax linen, 45% viscose. Front side pockets & 2 back pockets. 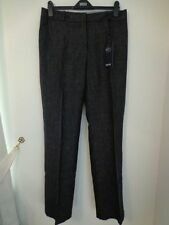 Ladies Trousers, M & S Collection, size 16 Reg. Pale blue. Machine washable. Linen and viscose mix. Two side pockets, two back pockets. Loose fit. M&S size 10 grey linen petit/short trousers. M & S Linen Look Trousers Size 10 Medium, denim look wide leg trousers Condition is New with tags. Dispatched with Royal Mail 2nd Class. M&S linen black trousers size 16 short. Condition is Used. Dispatched with Royal Mail 2nd Class. RUST COLOURED. WIDTH FROM THE GUSSET TO TOP OF TROUSERS - ABOUT 13". LINEN RICH/WIDE/TROUSERS. LADIES MARKS AND SPENCERS. THEY ARE FULLY ELASTICATED AT THE WAISTBAND/DRAWSTRING AND TIE AT THE FRONT/2 POCKETS AT THE FRONT AND BACK/LINEN RICH MATERIAL/WIDE LEG. M&S INDIGO COLLECTION LINEN TROUSERS, STRAIGHT LEG, SLATE COLOUR, SIZE 14. Straight leg, pockets, flat front, slate - NWT. M&S trousers size 12. Linen, cotton and viscose mix. Ladies M&S White Flax Linen Pull On Trousers Size 18. Condition is Used. Dispatched with Royal Mail 2nd Class. New listingNWT M&S Pure Linen Wide Leg Trousers Size 18 Reg Look!! NWT M&S Pure Linen Wide Leg Trousers Size 18 Reg, 36"/38" waist, part elasticated waistband, side pockets, optional belt, 30" leg, rear pockets, berry pink. M & S COLLECTION PURE LINEN CROPPED SUMMER TROUSERS. TURQUOISE. ELASTICATED WAIST. SIZE 16. PLEASE SEE PHOTOS FOR MEASUREMENTS. EXCELLENT QUALITY AND CONDITION. FRESHLY LAUNDERED AND IRONED. CLEAN SMOKE FREE HOME. OFFERS WELCOME. PLEASE SEE MY OTHER ITEMS AS I AM HAPPY TO COMBINE POSTAGE. WIDE LEG TROUSERS. LINEN BLEND. BOLD FLORAL PATTERN. ORANGE, RED BLUE MULTI MIX. ELASTIC AND DRAWSTRING WAIST. SIZE UK 12 LONG LEG. MARKS AND SPENCERS. Trousers have an inside leg measurement of 30 inches and are 42 1/2 inches from waistband to hem. Great trousers for holiday or just for the summer. They are a very relaxed style with wide legs. They have pockets and detail pockets on the back. Worn but still in good condition. I’ve lost weight and they no longer fit hence the sale. I’m having a clear out so please check out my other items. All items from a pet and smoke free home. BNWT FABULOUS PURE LINEN TROUSERS FROM M&S. TIE FRONT WITH PART ELASTICATED BACK. New Size 18 Womens M&S Cream Linen Mix Straight Leg Trousers. Condition is New with tags. Dispatched with Royal Mail 2nd Class. M&S Linen Mix Stripe Trousers. Bnwot. 16. NEW - M & S - Ladies White STRAIGHT Linen Viscoe Trousers - 14 - L 31 "..
M&S ladies pure linen trousers in natural colour waist 36"